While the Nintendo Switch constantly proves itself to be a wonderful platform to play games on, its eShop could do with a severe overhaul to ensure smaller games get the attention they deserve. So, until such a time comes, this is eShop Selects, the feature that has us highlight released indie games that may have slipped your attention. Coming under fire today is none other than Swords & Soldiers from Two Tribes. Not only did they announce the game for Switch today, they also released it so interested parties can get it now if they wish. That’s not all though, as it has also been confirmed that Swords & Soldiers is just the beginning for Swords & Soldiers II: Shawarmageddon have also confirmed for Switch and it will be out on March 1, 2019. The funniest strategy game in all of history! 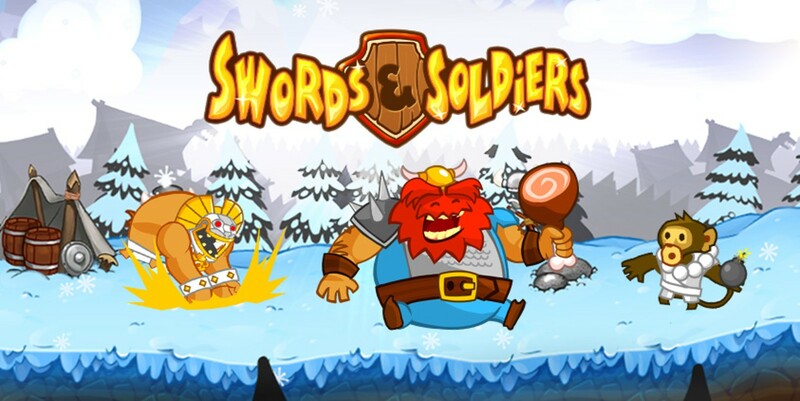 Prepare for war on Swords & Soldiers’ side-scrolling battlefields. Build your forces, engage in a tug-of-war for gold and energy, and defeat your foes with a huge grin on your face! Pick from 4 totally different factions: the brutal Vikings, devious Aztecs, crafty Chinese, as well as Chief Meat’s army. Each faction has its own reason to go to battle and its own campaign to play, adding up to many hours of side-splitting action-strategy. In this improved Nintendo Switch™ edition of Swords & Soldiers you can even go head-to-head with a friend on a single touch screen! So, what do you think guys? Will you be taking up the sword today? Let us know and if it isn’t, that’s cool too, because there are plenty of other indie games in the eShop just waiting to be discovered!